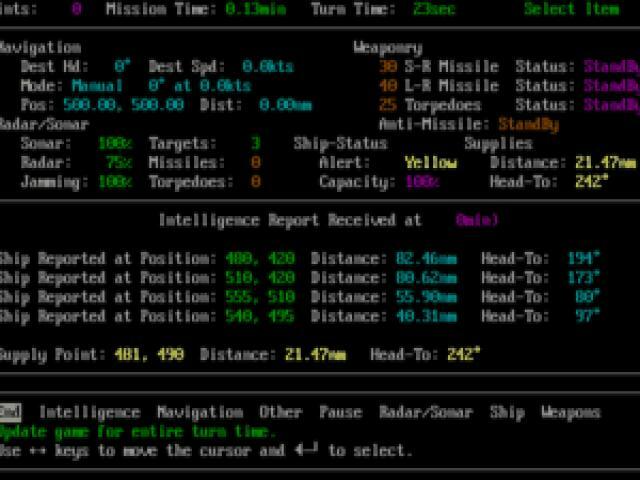 Although this little game is most definitely a naval simulation, you would be easily forgiven for not realizing this just by looking at it. It's a distinctly old-school maritime experience that doesn't really feature much in the way of graphics, being largely text-based, but still manages to be enjoyably strategic. The game's setup finds the player being thrust into a conflict at the tail end of the Cold War, with your frigate being surrounded by Russian ships. Your goal is simply to destroy as many of the enemy before they take you down and you are awarded a score depending on your kills and your evasive abilities. Although you are outnumbered, you are armed with a variety of defensive and offensive options, including radar, sonar, jammers and plenty of weapons. 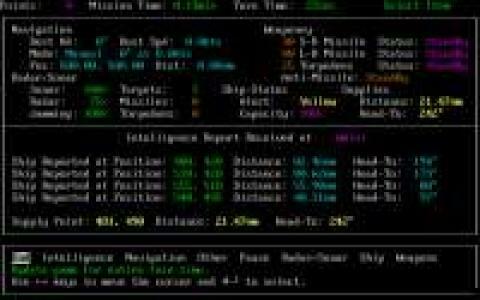 The screen is presented as a status and command menu, with plenty of information flowing past such as descriptions of what is going on around you, and the status of your ship. The whole thing plays out in turn-based fashion and you can issue as many commands as possible in the given time before handing things over to the enemy. Although Frigate isn't particularly impressive visually, and which may put some gamers off, once you get into the nitty gritty of the game, it turns out to be a surprisingly enjoyable experience. It's pretty easy to pick up but gets very challenging thanks to the depth of gameplay on offer here, and keeping track of everything that's going on is quite tricky. It's rarely less than enjoyable though so if you do like a bit of tactical action, then this is well worth a look.